Holocaust Education Week, which was hosted by Hillel Waterloo and Hillel Laurier and ended last week, featured a Holocaust survivor testimony at the University of Waterloo campus on Nov. 8. 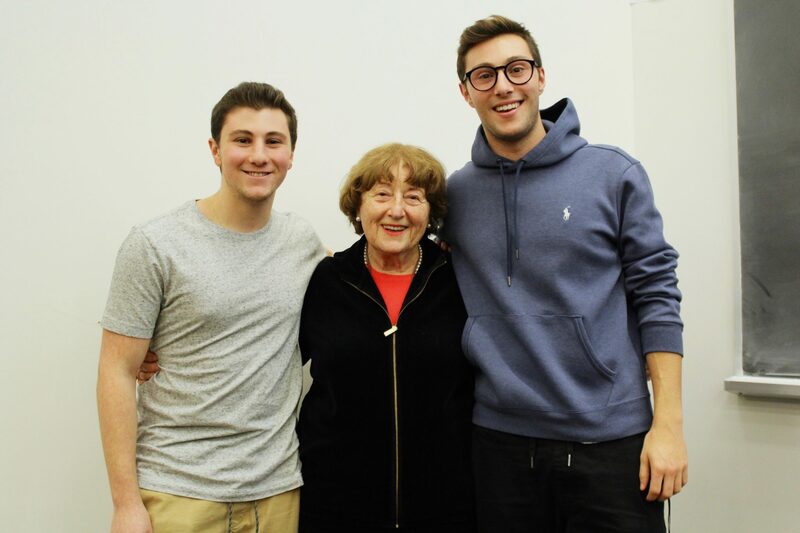 Holocaust survivor Berthe Cygelfarb used the opportunity to discuss and share her personal experiences during the Shoah. “My grandmother … talked about her times during the war — she was a hidden child in France — she also spoke about what was going on around her and in France [at this time],” said Kyle Cygelfarb. Kyle is a second-year BBA student at Wilfrid Laurier University along with his brother Will Cygelfarb, fourth-year health science student at Laurier who were both present at the event in support of their grandmother. Shedding light onto the untold horrors of the Holocaust and the genocide that occurred 70 years ago has become a yearly necessity through this education week in order to reach younger audiences and continue educating people on the atrocities that people faced during this tragic period of history. “There are so many Holocaust deniers out there and there’s been a lot of hate going around, like anti-semitism, a lot of anti-cultural, anti-sexual preferences [issues] — and it’s been going on for so long now. Recently, [with] the events that happened at Pittsburg, it kind of just relates back to what happened in World War Two,” Cygelfarb said. Eva Plach, associate history professor at Laurier, whose research interests include the history of Polish Jews, recognizes and stresses the importance of events such as this. “I think if we talk about survivors, specifically … many survivors are dying or we have very few survivors left,” Plach said. Plach, like Cygelfarb, believes that in a broader context, Holocaust Education Week is important to keep the memory of the Holocaust alive and to ensure that people — not just those of us who are younger — understand what really happened. “There’s a contemporary moment right now where people are talking a lot about how politics can turn in particular directions and people are looking for historical precedents — not at all suggesting we’re moving toward a Holocaust,” Plach said. From her perspective, Plach is heartened both as an academic and a person, to see there is still so much interest in Holocaust history, especially so many years after the fact. It remains a reminder of the potential that humanity has to make terrible choices — and how we might work to recognize that in the future. “I bristle, sometimes, at the idea that ‘oh, we need to know history so that we never repeat it,’ but I think there’s ultimately a little bit of truth in that. There is something that is everlastingly compelling about that statement: that if we understand context and if we take education seriously, then people are better equipped to analyze their own modern-day realities,” Plach said.